Years ago, when I heard the word community, I thought of my childhood home and the town in which we lived, a rural town where I was free to walk to the playground, the park, the pool, and my friends’ houses. Community made me think of Mr. Rogers’ Neighborhood and Sesame Street. Now I know community to be so much more. Even our social studies curriculum today asks our kindergartners, How do people in a community cooperate? and discussions focus around jobs and services and firefighters and post mail deliverers and teachers and police officers and store clerks. But now we know that community can extend far beyond the physical space. That relationships are forged, ideas exchanged, and services rendered without ever having to leave the comfort of our familiar spaces. Something fun I’ve learned about virtual communities – they exist because we want them to exist. We create them. They emerge out of a need, out of shared passions. Members don’t have to share physical space in order for the community to thrive. These spaces just need our time and attention, and they’re strengthened by the members’ desires to come together for a shared purpose. I’m embarking on a new role as technology integrator, and I know I need support. I created the Instructional Technology Integrators/Coaches community on Google+ because selfishly I was hoping there were others out there who would share their ideas and resources with me. Just yesterday after only a few months of existence, our community reached over 400 members. I’m so grateful to the teachers, administrators and coaches who have taken the time to post ideas, ask questions, ignite conversations, and share resources with the group. Please consider joining us if you have not done so already! It’s just one of many communities I have embraced as part of my learning network. First there was Connected Principals. Then PLP. Edcamps. ETMOOC. The #edchat crew and now the #edtechchat team. There are countless ways for educators to become members of dynamic, nurturing, knowledgeable communities. It takes time and a willingness to contribute. The payoffs are huge. When do our students need to know this? 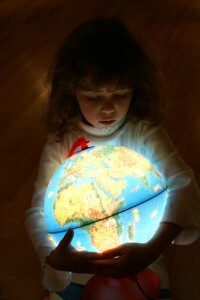 Upon entering kindergarten, are children already cognizant of their role in the global community? Why should we limit their view of what a community is and can be by simply discussing jobs and services within the city limits? Certainly I want our young children to know how the fine folks who serve them support a community in need. But, there’s a whole wide world and a global community waiting for them. A textbook definition of community just doesn’t cut it anymore. There are a multitude of ways we can help children become contributing citizens in their global learning community. Through Global Read-Alouds and Skype in the Classroom and Kiva and quadblogging and the experiences shared in Connected Learners and sophisticated service projects and collaborative work as students progress through their school years. And most importantly, by sharing with students that you, too, are a member of communities that extend beyond the school’s walls. This post is dedicated to @Joe_Mazza who reminded me that I used to blog a lot more often. I loved seeing your name in my stream today! Felt like old times again. The lesson I want my students to learn is that digital tools can make any kind of community possible no matter who you are or what you are interested in. Like your example of wanting help with your tech integration role, ANYONE can build a community. NO ONE has to wait for someone else to take the lead. That’s when we’ve won — when our kids recognize that they don’t have to wait for anyone else to lead their own learning. They can work it out on their own. Does that make sense? It feels like unpolished thinking to me. Very true, Christopher. Those are special communities, indeed! Next PostNext Teaching is learning!